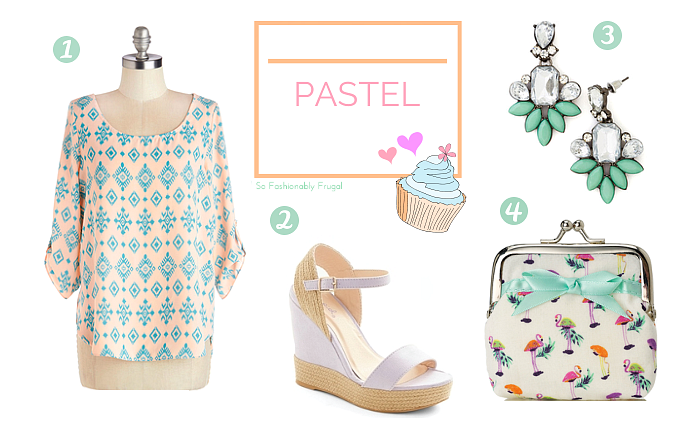 So Fashionably Frugal: Warm Pastels for Spring! Happy Spring everyone! It might not seem like it where a lot of us live, but soon it will be a time to wear big flowy skirts and sandals! So to hopefully get the warm weather on it's way a little quicker...today's post is all about pastels! Pastels are trending right now thanks to New York Fashion Week. The colors go together stunningly, but if you are a little nervous about trying this trend out, start with one large pastel color paired with many neutrals. Think a robin's egg dress with grey tights, black shoes, and a striped blazer. If you need some inspiration for pastel outfits, check out the latest board on my Pinterest for ideas. I'll be updating it frequently for you!